Most programming languages (including PHP) contain a command to convert a JSON string to an object and the Poker_API() function has been modified to do just that. The legacy system still works as before and you can still see those examples on the API_Examples2.htm page. An API reference utility is now available to assist programmers with the API. It not only documents every API command and parameter available, it can also make a call to your server without requiring any code so that you can get a live sample result. Keep in mind that the API password is passed as one of the parameters on every call from the computer running the PHP script to the computer running the game server. Therefore you should only allow the scripts to be installed on a system that you have control over. PHP code is executed on the server side so that the source is not visible to the person running it from their browser. However, if the scripting processor somehow became disabled, the server could send the raw script back to the user. To prevent your API password from being exposed in this case, you can place it in a separate file and store it in a directory located outside of the www tree. Then it would only be accessible via the local file system and not via HTTP from the outside world. The following PHP file (API.php) will be included in the examples to follow for interfacing with the game server. 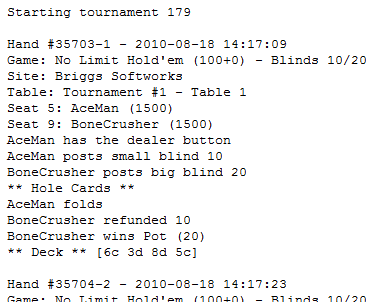 The Poker_API function uses the free PHP libcurl extension to make a POST call to your game server, passing it the desired parameters, and then returns an object containing the API results. 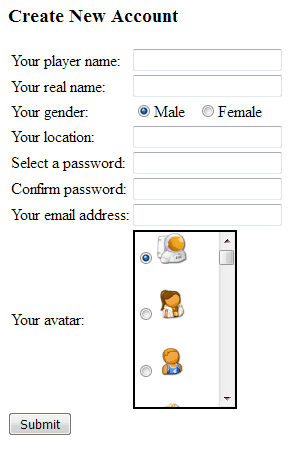 The function automatically encodes all parameters and includes the required Password and JSON parameters. You simply pass the Command and other relevant parameters to Poker_API inside an associative array. If you get an error message indicating that curl_init() is an undefined function, then you do not have the libcurl extension installed with your PHP setup. If your web site is on a managed system, contact your site operator for assistance. If you're installing PHP locally using EasyPHP, then all you have to do is right-click the EasyPHP icon in the sytem tray, select Configuration, PHP Extension, and then make sure php_curl is checked in the extension list. Before saving the code below to a file called API.php, change the $url variable to your actual game server address (with file port and /api path). Change the $pw variable to your actual API password. Protect your API password! See the Security section above regarding the location of the file on your server. This is a very simple example (SysStats.php) that calls the SystemStats command and displays the data returned, including the current number of logins, filled seats, occupied tables, and server up time. 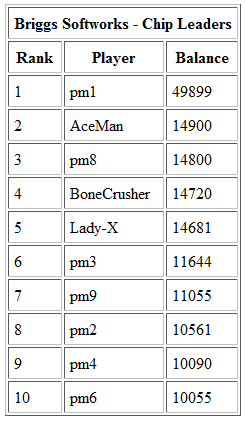 This example (ChipLeaders.php) displays the Top 10 chip leaders on your site. // Fetch the Site Name using the SystemGet API command. // Fetch the list of players using the AccountsList API command. // chips array keyed on player name. // Sort array in decending order. // Display results in an html table. $a = "display: inline-block; width: " . $avatarsize . "px; height: " . $avatarsize . "px; background: " . 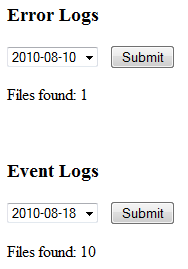 This is a PHP example (LoginStats.php) that parses through one or more event logs and calculates login statistics. Specifically, for each period of server up time, it displays the total number of logins, unique logins, and peak logins. The total logins is just a simple count of logins. 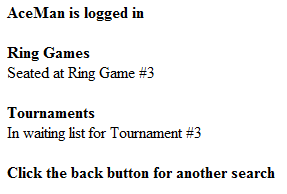 If a single player logged in and out 10 times then 10 is added to that count. 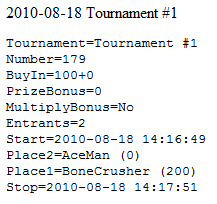 The unique count is the number of different players that logged in at least once during that time. The peak count is the maximum number of players that were all logged in at the same time. Note: if you see a "?" in the Start or Stop column of the output, that means the server went online or offline outside of the date range selected (a new log file is started when the clock passes midnight). In your log settings, you must have "Log system events", "Log login events", and "Log logout events" all set to "Yes" to use this function. These are various examples that show how to automate logins from an external web page. This first one (Login.htm) is just a simple HTML form (no scripting) where the user inputs their own login name and password and it is forwarded to the player client directly. Replace the URL in the action parameter with your own. Remove the target parameter if you want the poker client to load into the current window instead of spawning a new one. The Callback Event system is not technically part of the API. It is a separate "reverse API" system where the server will make a call to your code (hosted on any web site) when certain selected events occur on your poker site. See the Callback Events group on the System tab for the full list of options. The following PHP code sample (Callback.php) will create a log of events as they occur in real time and write them to a local file (Callback.txt).